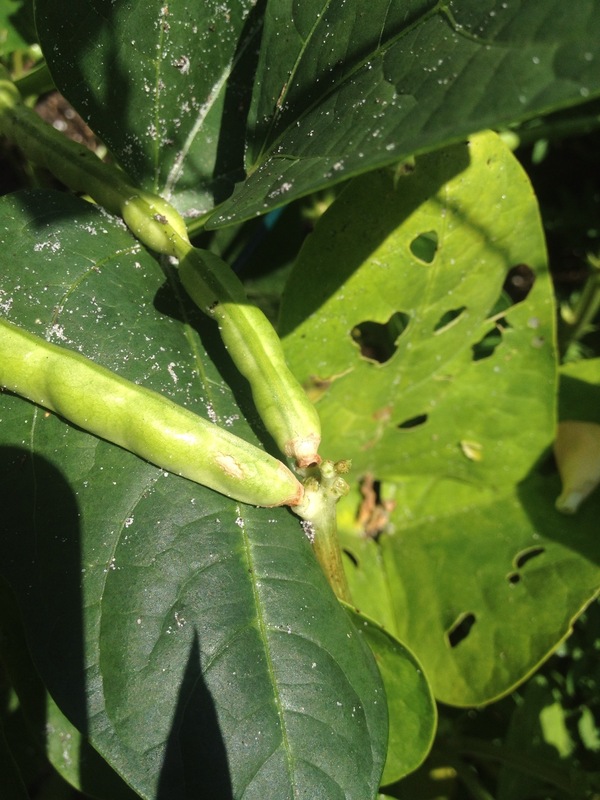 Cowpeas — here, there, everywhere! 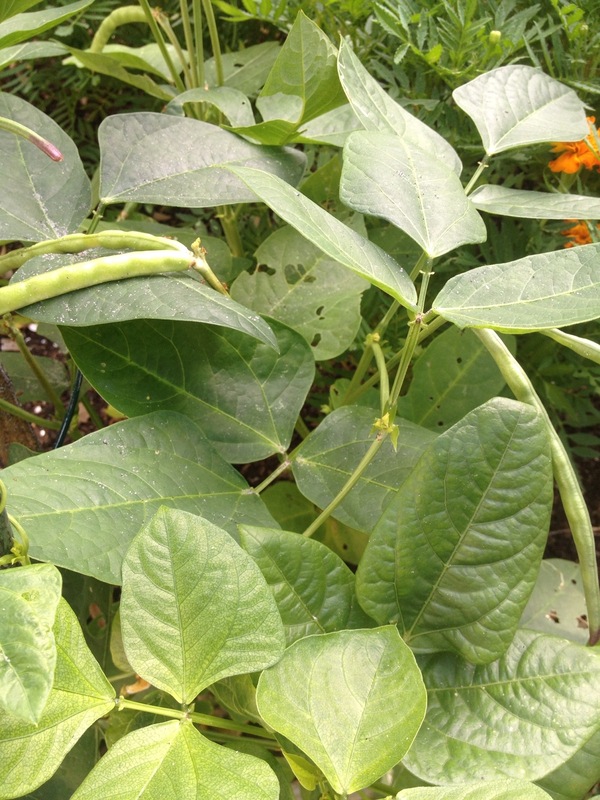 The first wave of cowpeas has now yielded the first cowpea harvest of the season! 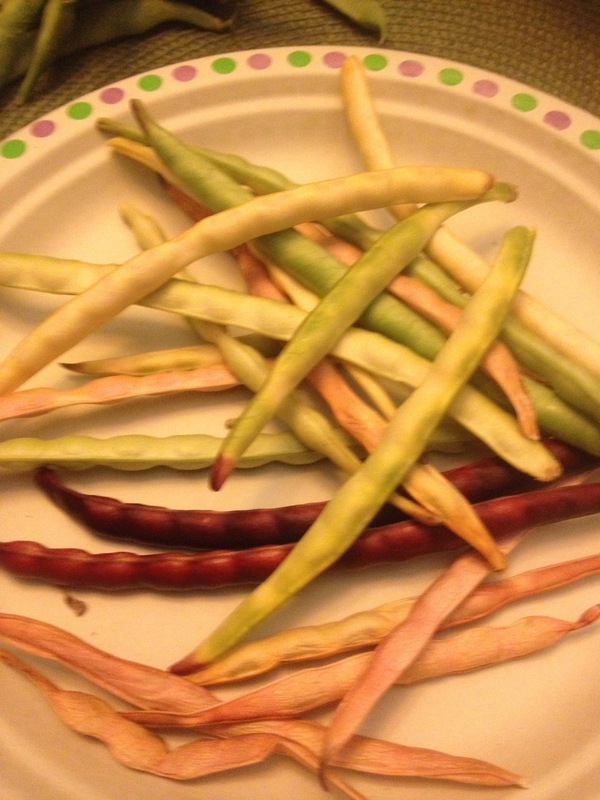 And given that this is the first time I have ever tried growing them, this was my first cowpea harvest ever!! Aside from the “firsts” involved, there wasn’t all that much that was noteworthy about them. The total yield is shown in the picture above. These came from the pods in the picture below. That’s it. As you can see, they were a mixture of black-eyed and pink-eyed (actually somewhat purplish, but they appear almost brown in this picture). Some of them were green, while others were cream colored. The pods included various shades of green, brown, and purple. 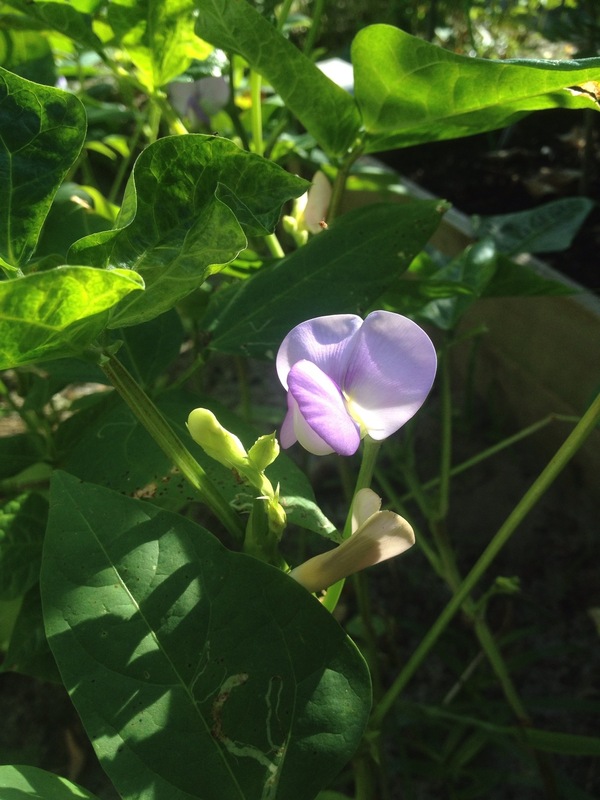 If you are familiar with cowpeas or if you have been following my blog posts regularly, you will recognize that the purple pods yielded the pink-eyed peas, given that one of the varieties I planted was Pinkeyed Purple Hull. The others were all California Blackeyed #46. The small yield was not a surprise to me, as I had only planted a few seeds of each kind for the first wave. I did that largely to see how they did with the tight spacing prescribed for the SFG method. As best I can tell, they did just fine. Other than their tendency to lean toward any open space nearby, I didn’t detect any signs of stress due to crowding. To compensate for the small quantity, we added them to a batch of cream peas that we bought at the farmers market and had mixed cowpeas with our dinner. We enjoyed them very much. What surprised me was that the black-eyes ripened up all at once, but the pink-eyes ripened one or two pods at a time. The black-eyed plants mostly died as the pods matured; the pink-eyed plants are still growing and are still producing a few pods every day or two. You can see them in the picture below, nestled in between marigolds and a tomato. I planted considerably more seeds for the second wave, so I should get a much bigger yield. For this wave, I planted three varieties: Mississippi Silver, Red Ripper, and SaDandy. They have all grown enough to where I can see significant differences in their characteristics now. The Mississippi Silvers are shown in the picture below. About a week ago, they very suddenly displayed a tendency to get very floppy, for lack of a better word. They haven’t produced vines or had a tendency to run along the ground; they simply flopped over and didn’t stand back up. I ended up rigging a support out of bamboo stakes and stretchy plant tie tape — partly to get them up off the ground, but mostly to give myself room to walk, so I could get to my zucchini and tomato containers. Other than the floppiness, they appear perfectly healthy. They are producing pods, which should be ready in another week or two. As I understand it, the pods are supposed to turn silver when they ripen, which is where they get their name. I’m looking forward to seeing them. Of all the varieties, the Mississippi Silver had by far the prettiest flower. You can see one of the blossoms below. The second variety of wave two is the Red Ripper. This is the one that is supposed to vine, and they have now started doing just that. Many of the plants needed help finding the trellis that I placed along the center. Instead, they lay down outward, away from the trellis and started running along the ground. As with the Mississippi Silver, I rigged up some supports to help guide them toward the trellis and to give me room to walk. They are not showing signs of producing peas yet, but this is consistent with what I have read about them. The last of the wave two varieties is SaDandy, a traditional Southern variety of cream pea with a reputation for excellent taste. These plants are still standing very erect with no signs of flopping over or producing runners. They are producing many pods which, as you can see below, are being held up above the foliage. Based on the size of the pods, I will not be surprised if these are ready to pick before the others. The third wave consists mostly of California Blackeyed #46 and Pinkeyed Purple Hull, with just a few Mississippi Silver, as I finished off that seed packet with this planting. There is nothing spectacular to report about this wave. They are simply growing as I would expect. Here’s a picture of how they look now. 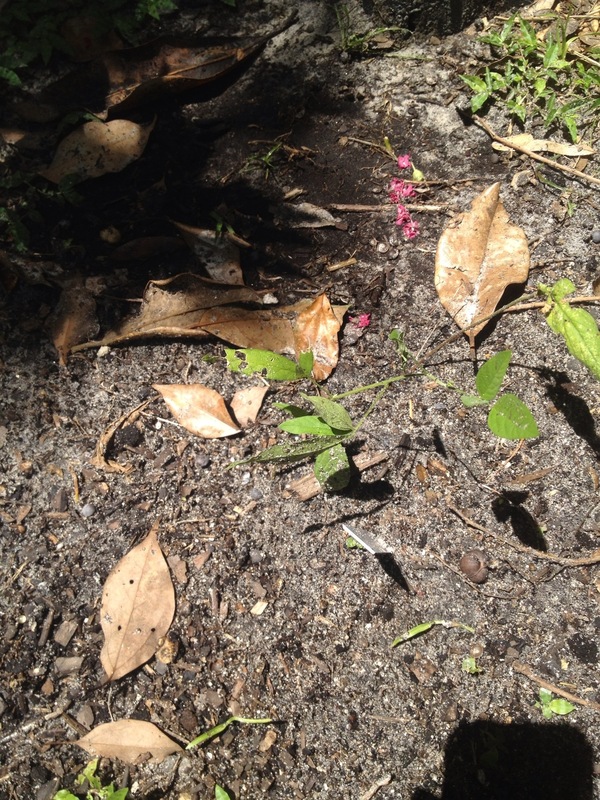 So, I decided to replant that flower bed and use it for more cowpeas at the same time. 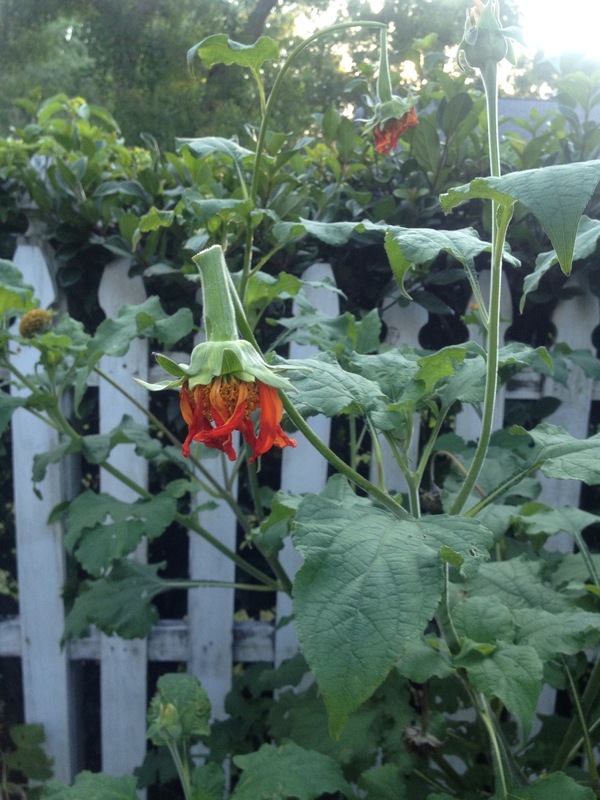 I saved the few remaining healthy flowers, but mostly did a complete restart. 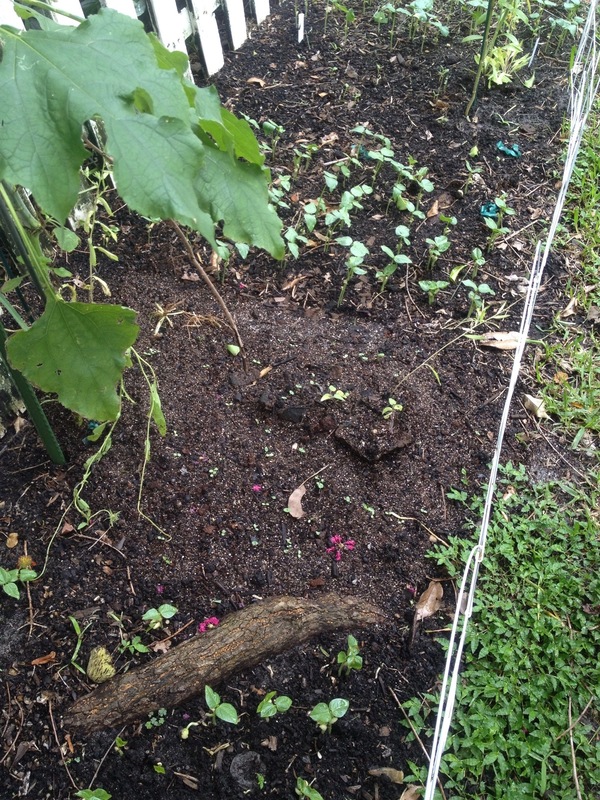 After cleaning out the weeds, I planted alternating patches of cowpeas and flowers. 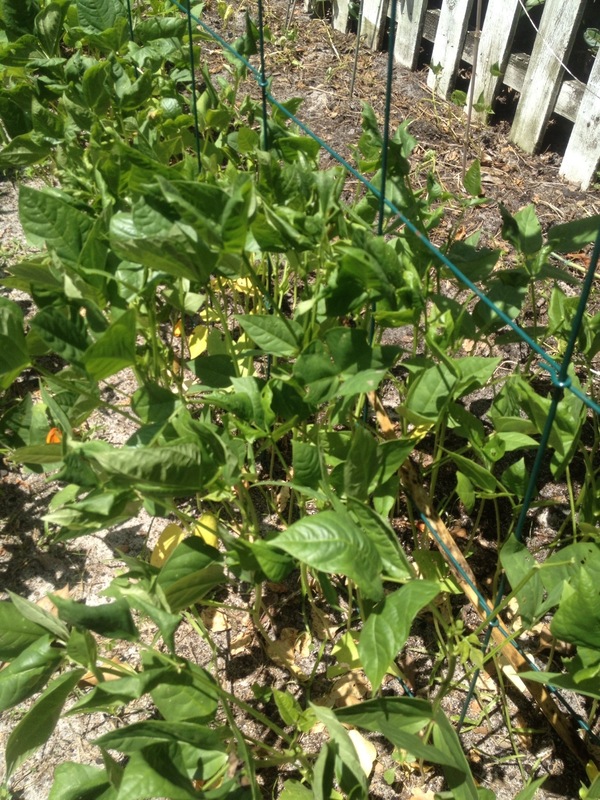 The cowpeas include the remaining SaDandy (only a handful), the remaining Pinkeyed Purple Hull (a few short rows), and the remaining Red Ripper (about three short rows along the fence, so they can climb), with California Blackeyed #46 everywhere else. 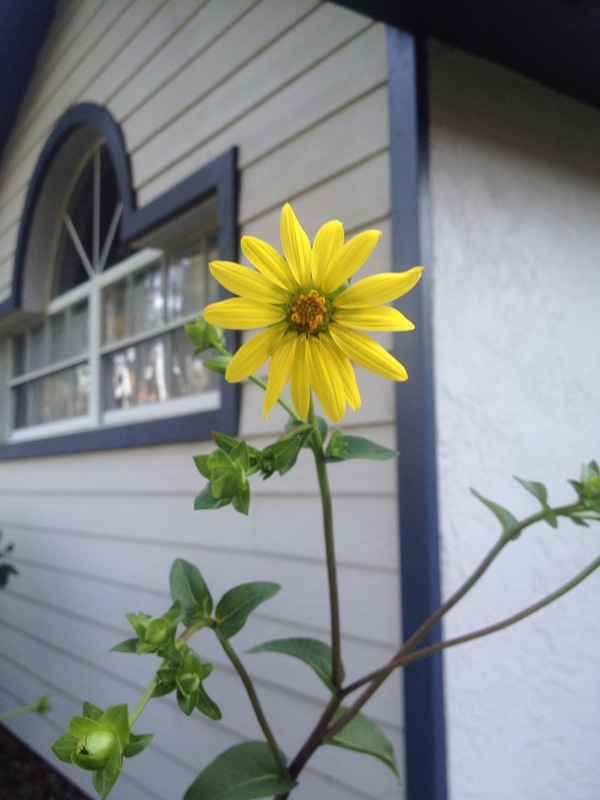 The flowers include two varieties of sunflower (Autumn Beauty and Irish Eyes) and three varieties of native Florida wildflower (scarlet sage, gaillardia, and coreopsis). All of these are good nectar sources for butterflies and other beneficial insects. 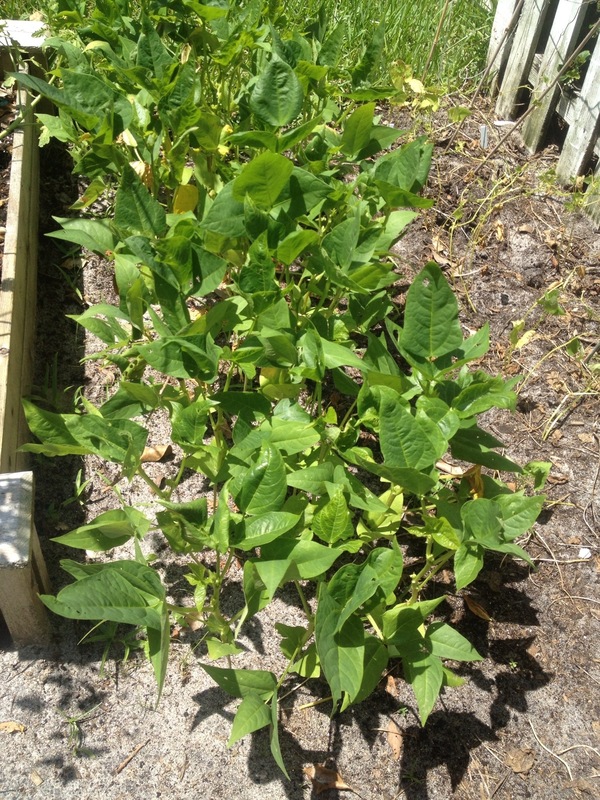 As you can see below, the cowpeas have gotten off to a good start. Some of the wildflowers are also beginning to appear but are hard to see here. I have not seen any signs of sunflowers yet. As a postscript to all this, I am hoping to continue with a wave five. I just need to figure out where to plant it. In addition to the black-eyed peas I have remaining, I have also gotten my hands on another variety, which my wife and I found at the farmers market and have been enjoying very much all summer: Zipper Cream peas. 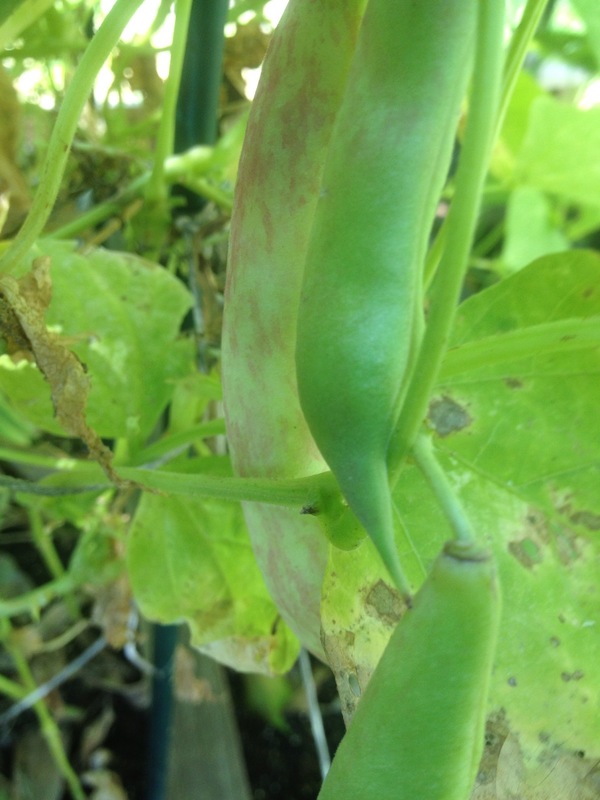 They are a type of crowder cream peas, in that they have the mild, smooth taste of cream peas, but the peas grow very large in the pod, literally crowding against one another. I am looking forward to growing some. I just need to find a space! 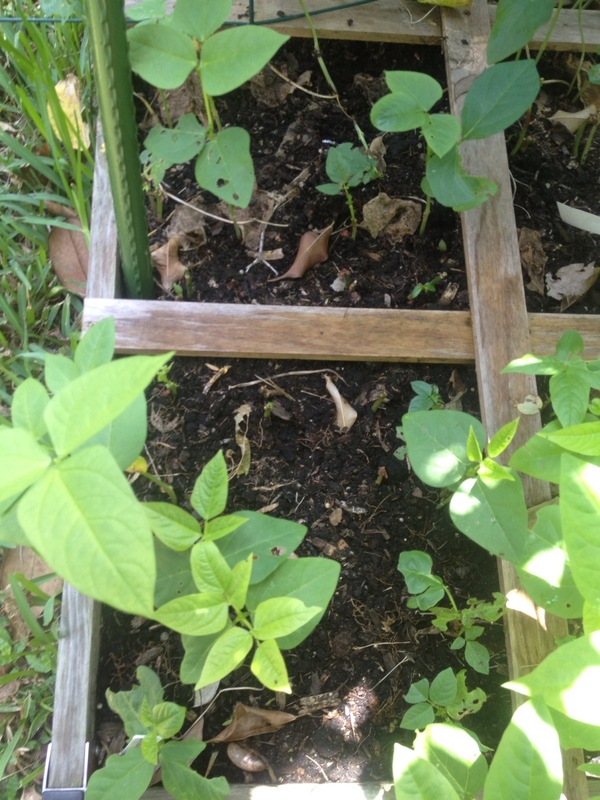 I’m happy to report that my rookie season growing cowpeas is proceeding nicely so far. As I mentioned in my first posting on this topic, I started this venture with two varieties: California Blackeyed #46 and Pinkeyed Purplehull. These two varieties were planted about a week apart in early to mid May. 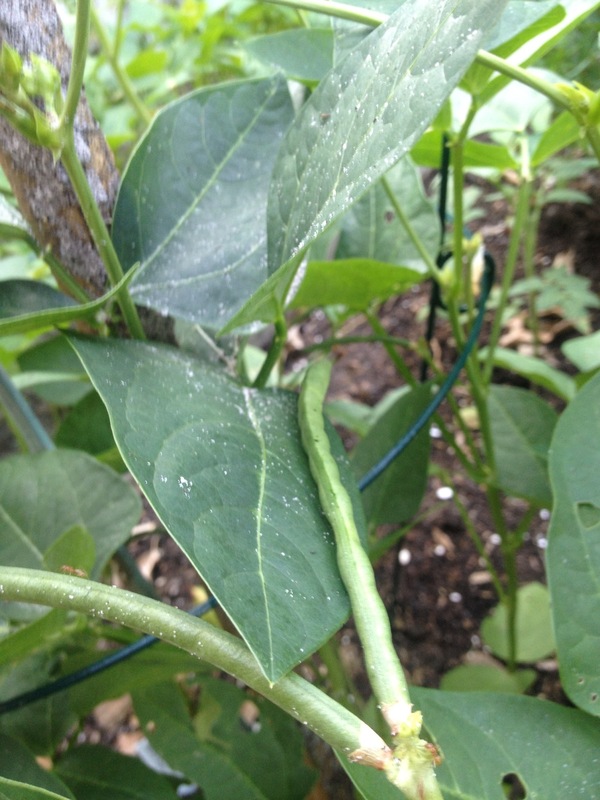 The Blackeyed peas, which were planted first, now have numerous pods on them, and should be ready to harvest before too much longer. As shown clearly in the picture below, the pods are growing (mostly) in pairs, forming the shape of the letter V.
The Pinkeyed Purplehull are, as expected, a little behind, but they are starting to produce some pods such as the one visible below. 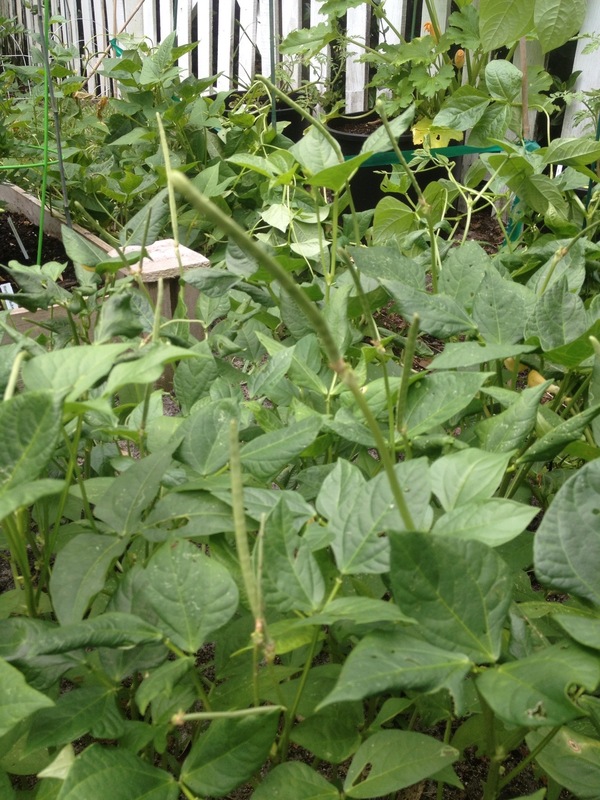 The pods are not purple yet, but they should turn purple as the peas mature. 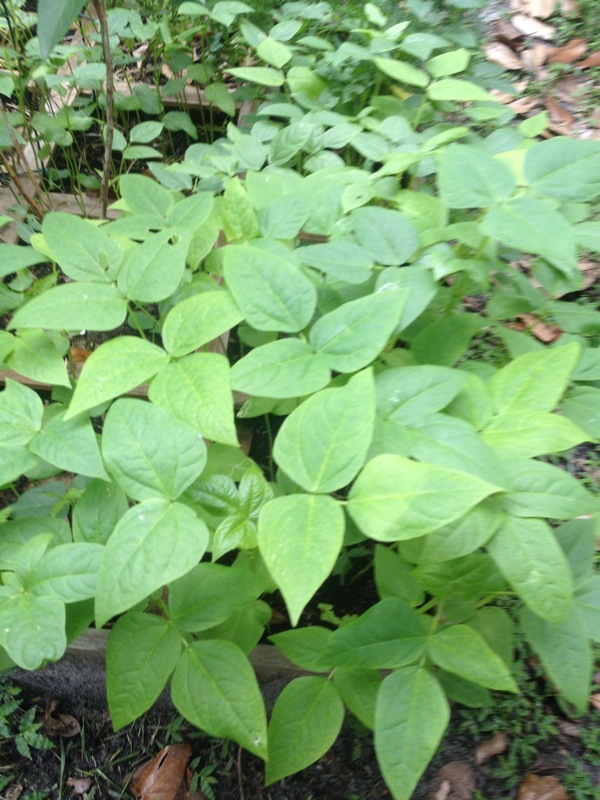 The second wave of cowpea planting took place over the Memorial Day holiday at the end of May. 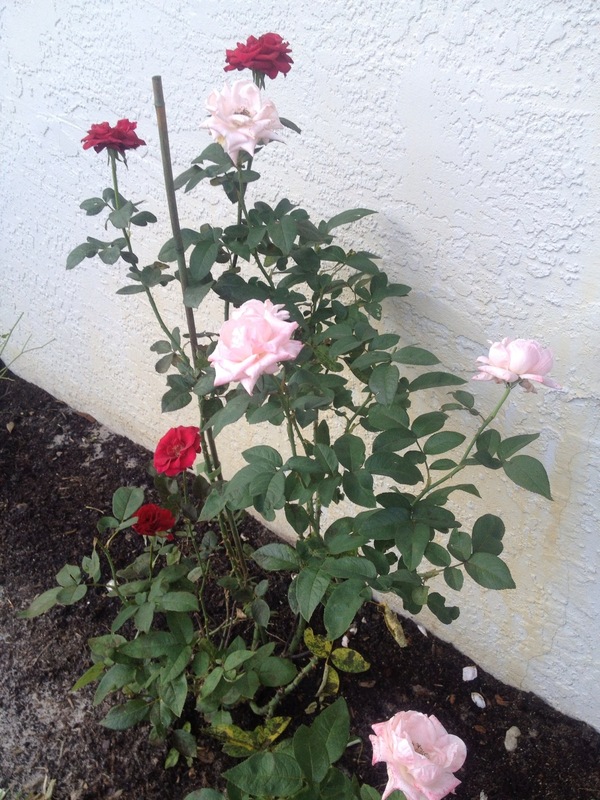 In this planting, I added three more varieties: Mississippi Silver, Red Ripper, and SaDandy. I chose these varieties to give myself a good cross-section sampler of these plants. They are all coming along nicely, just about as expected, as shown in the pictures below. The next picture shows the Red Rippers. As I mentioned previously, I placed a trellis in the middle of them because they reportedly produce vines and like to climb. I’m not seeing any vines yet, but I won’t be surprised to see them about the time the plants start blooming. 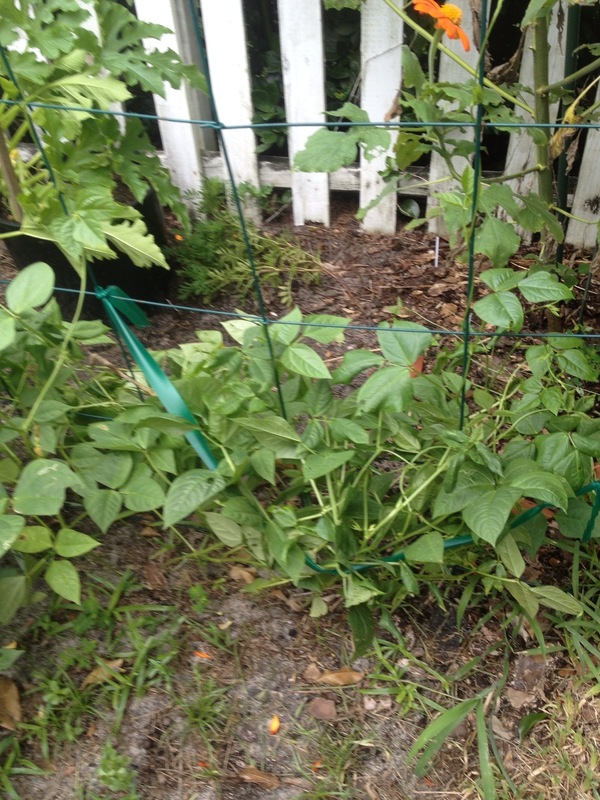 As an aside, those of you with keen eyes may notice the empty space between the cowpeas and the fence in these two pictures (above and below). 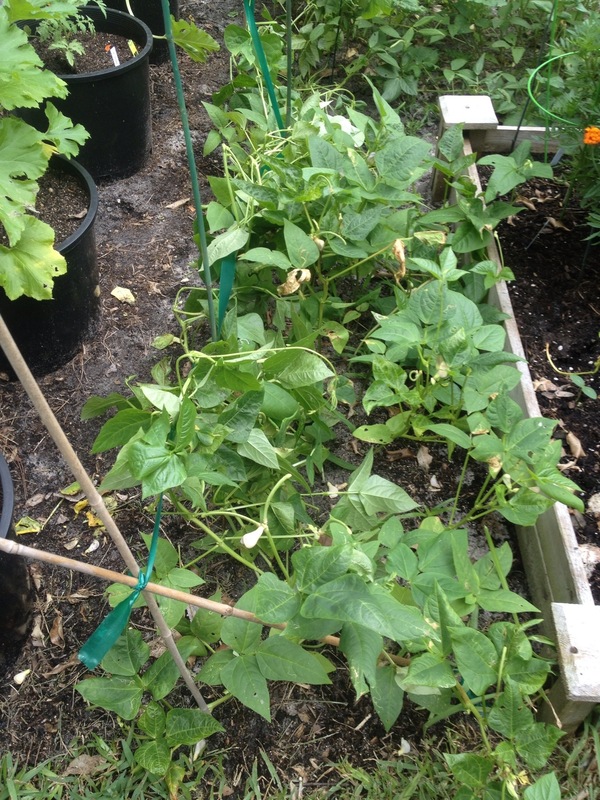 Until a few days ago, I had a row of white half runner beans planted there. We had several meals’ worth of those, but the plants had run their course, so I had to retire them to the compost bin. I’m planning to plant my Nickell Beans in that space in September. In the meantime, I’m trying to decide whether to plant a short-season crop there or to let it lie fallow or what. If I plant something there, I’d like it to be something other than a legume, so that I don’t have three crops of legumes in a row. Anyway, back to the cowpeas, the last variety of the second wave, SaDandy peas, are shown below. 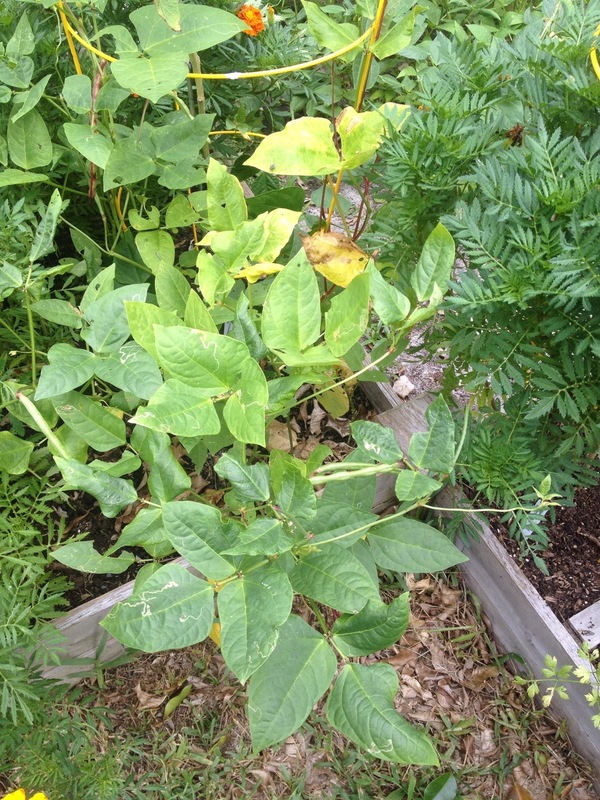 Although not a cowpea, I did plant another type of hot climate legume at the same time, and am including them with the cowpea project. Pigeon Peas, native to India and highly popular in the Bahamian dish called Peas ‘n Rice, are found throughout the Caribbean region in various local cuisines. I only planted two small hills of these, as they are supposed to grow into fairly good sized bushes. One of these hills is doing quite well, as shown in the next picture. The second hill, just a few feet away from the first, is looking rather pitiful as you can see. I don’t know enough about these to even speculate as to why. Only time will tell whether they start to do better as the season progresses. Pigeon Peas are slow to mature, so it could easily be Christmas before we see any on the dinner table. 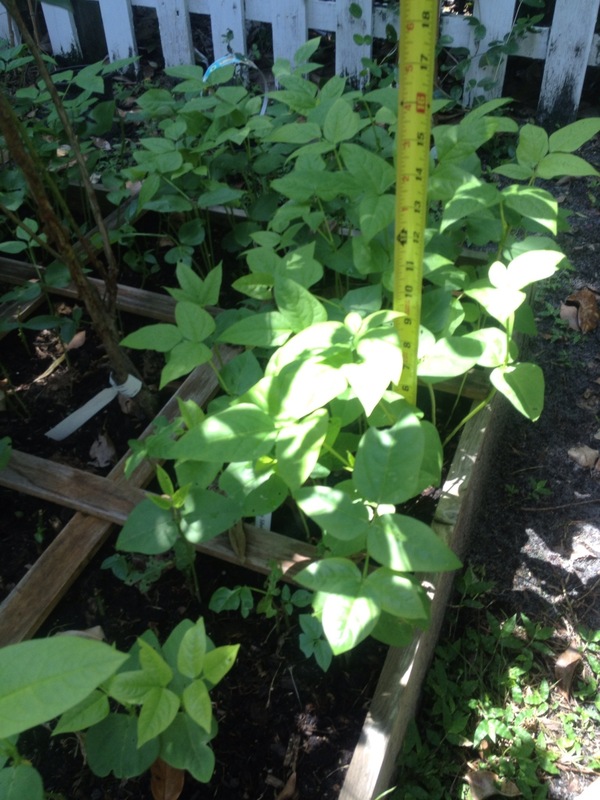 The third wave of cowpeas, as reported in the Cowpea Project Update post, was planted in the middle of June. That wave include three varieties: California Blackeyed 46, Pinkeyed Purplehull, and Mississippi Silver. These were all planted in available space within the blueberry bed. As regular readers may recall, I was not sure how they would do in the acidic soil of that bed. I can now report that they seem to like it just fine, as you can see below. The only ones that are not doing well are the ones that suffered an attack of sudden-onset squirrel foot wilt. 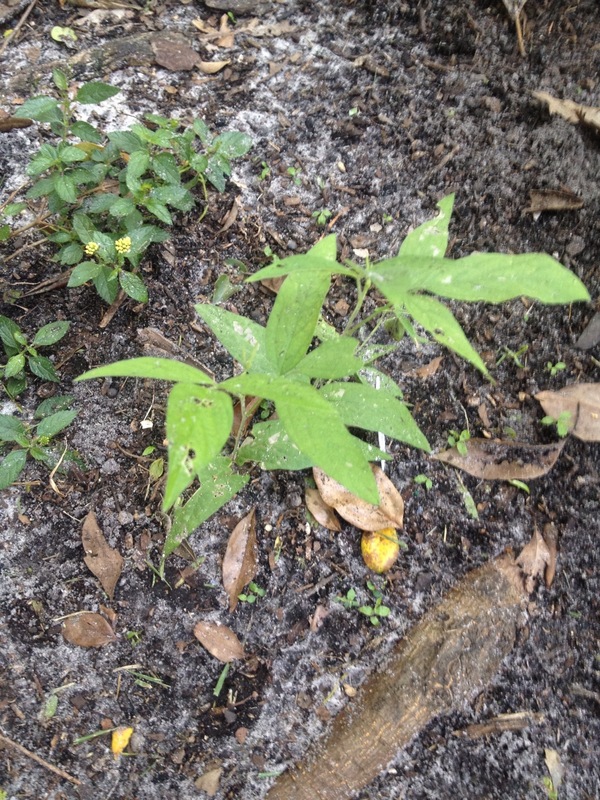 This is a disease that happens when I forget to sprinkle cayenne pepper over newly-planted seeds or around young seedlings following a rain. I know with absolute certainty that this is what got them, because I was tethered to a conference call, watching helplessly out the window, while the little furry-tailed bugger happily dug around in those two squares. I haven’t planted a fourth wave yet, but I’m thinking about it. I still have seeds on hand for each of these varieties except for the Mississippi Silver. 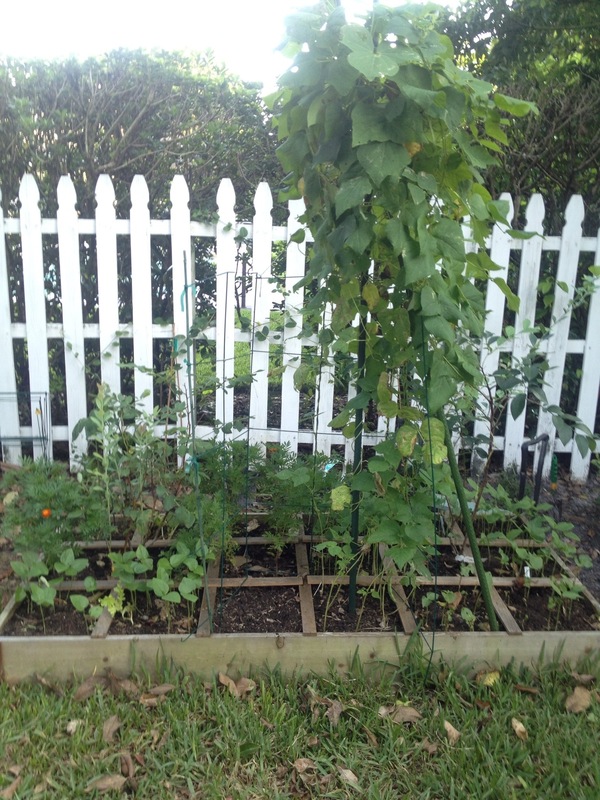 The limiting factors are space (including reserved space for my fall garden) and hours in the day. 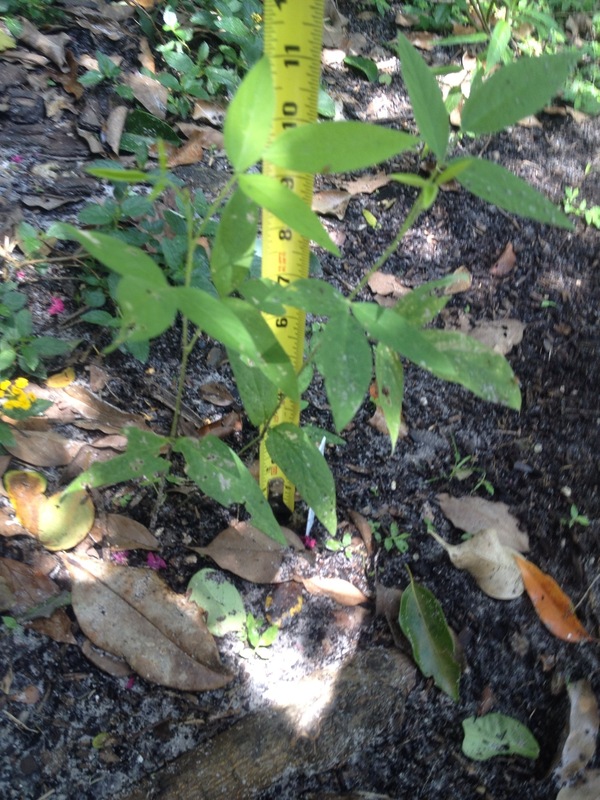 Tropical Storm Debby pulled away on Wednesday after dropping a total of about 7 or 8 inches of rain on the area. As the skies cleared and the sun started to dry things out, I was able to return once again to my garden and make an inspection tour. I was actually very pleasantly surprised to find that nearly everything had not only come through unscathed, but seemed to have been relishing the deep, soaking rain. I will use the pictures I took during that tour to give you a quick guided tour. 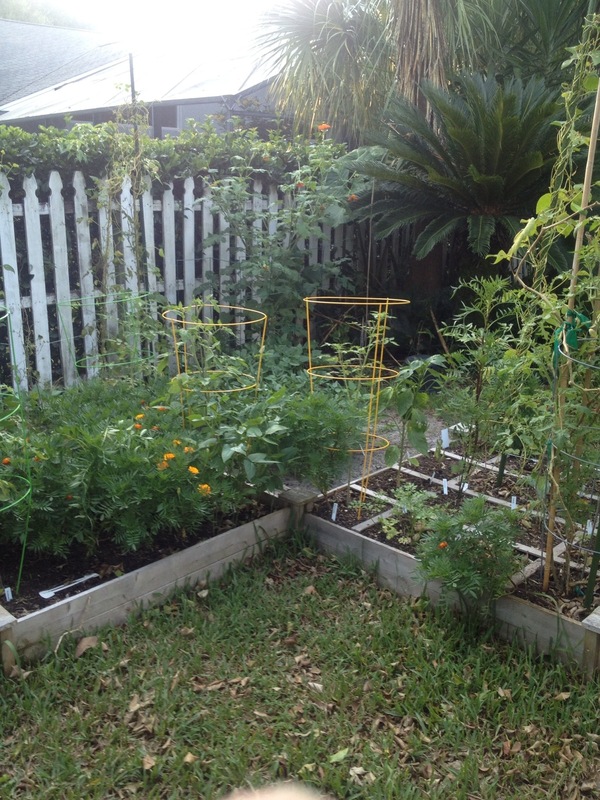 The pictures below provide an overview of my vegetable garden. 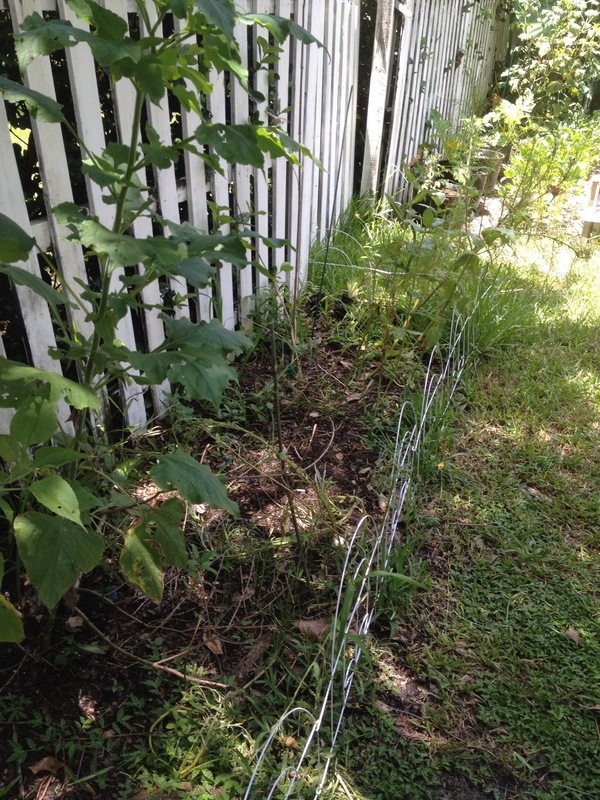 The first one shows two of my 4×4 raised beds in the foreground, with my cowpea patch just beyond. Although they’re hard to make out in this picture, I also have a row of green beans (White Half Runner) planted along the fence in the background. Those beans were planted in March and have about run their course, so I will be taking them out in the next day or two. The next picture shows my SFG bed, a 4×4 raised bed which is the only bed I currently have planted in strict accordance with Mel Bartholomew’s Square Foot Garden specifications. As you can see, the plants in this bed are thriving, so thus far I give a big, green thumbs-up sign regarding this approach. 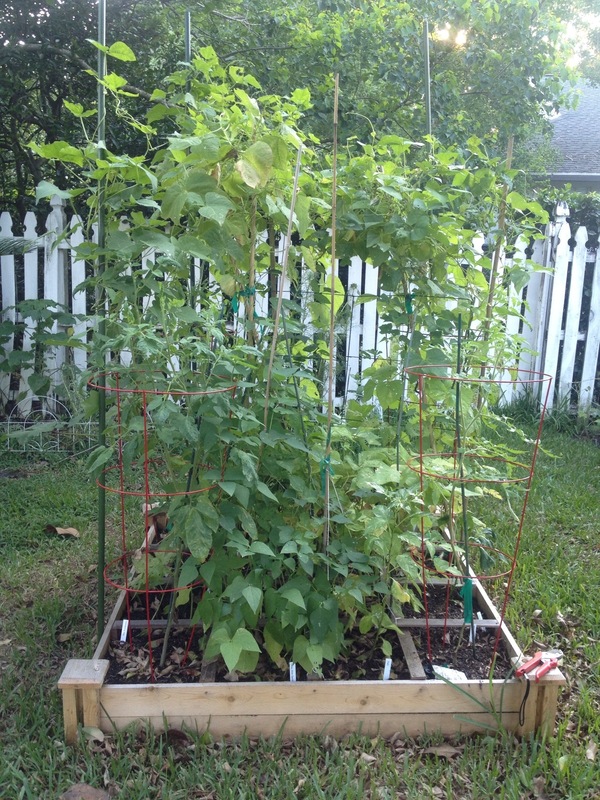 My fourth and final raised bed is the 3×6 bed shown below. Its primary purpose is to be a blueberry bed, but from this angle the two blueberry bushes are hard to discern. One is located just to the right of and slightly behind the bean tower in this picture; the other is in the mirror-image location on the left. 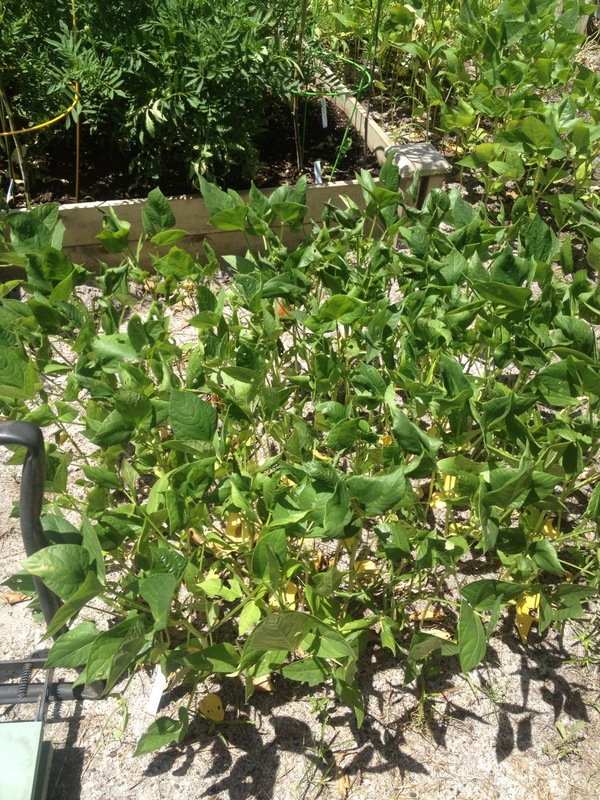 The beans you see growing up past the top of the picture are Kentucky Wonder beans, all growing from a single square foot. You may notice above that the square just to the left of the beans is empty. 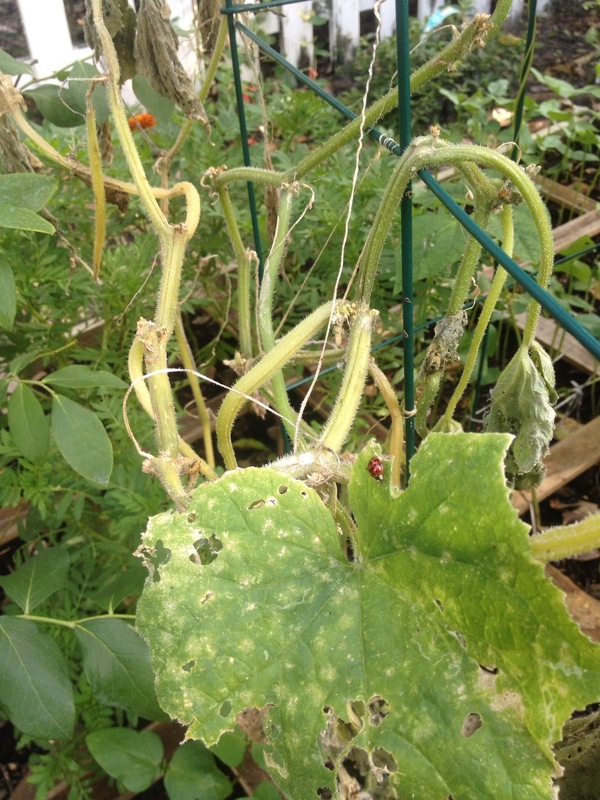 I had to remove the cucumbers previously growing there, because sometime during the storm, they succumbed to what I presume was a squash vine borer attack. Here is what they looked like when I found them. 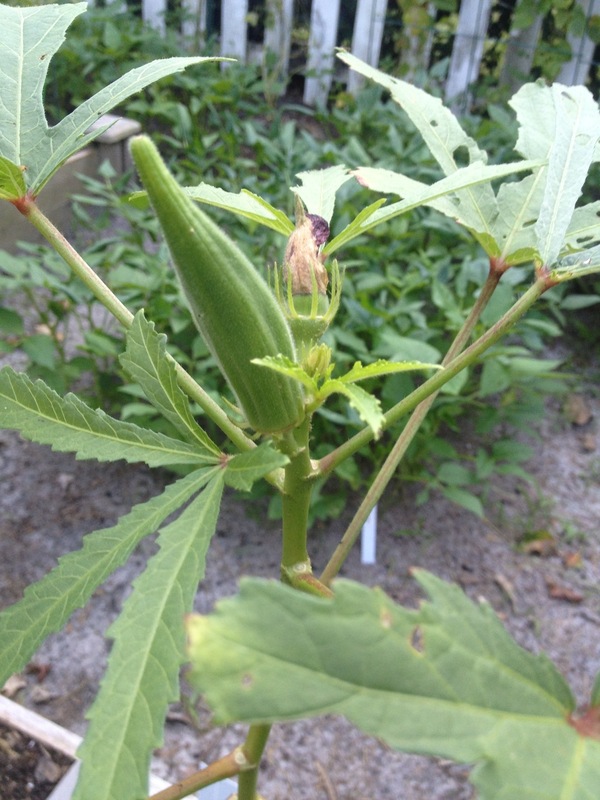 Moving on to happier thoughts, the next two pictures show some bell peppers (Sweet California Wonder) and the first okra pod (Clemson Spineless) of the season. The next two pictures show varieties I have never grown before, and which I am anxious to see on my dinner table. First, you can see a close-up of Lina Sisco’s Bird Egg beans. The pods become streaked with purple shortly before ripening. They are then allowed to dry on the vine before harvesting. The shelled beans themselves are very pretty little dried beans with a white or cream color, mottled with purple. 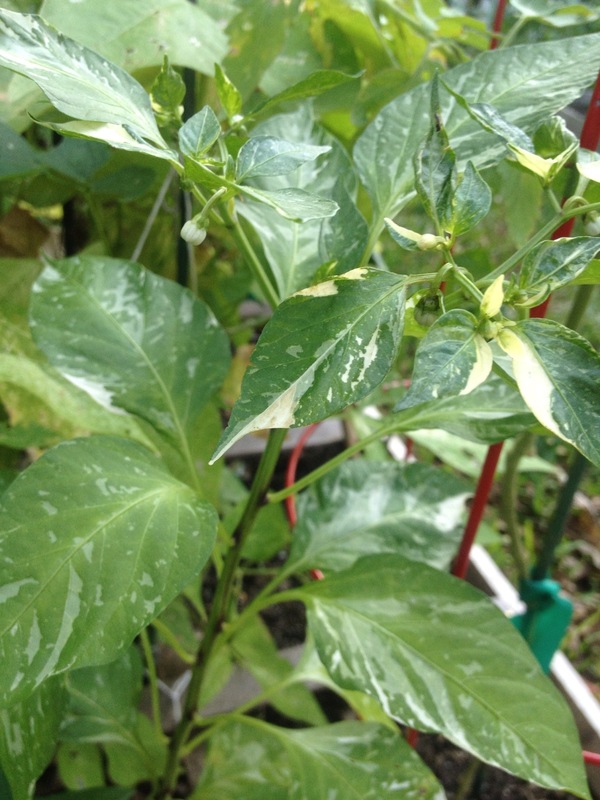 Second, you can see a Fish pepper plant. 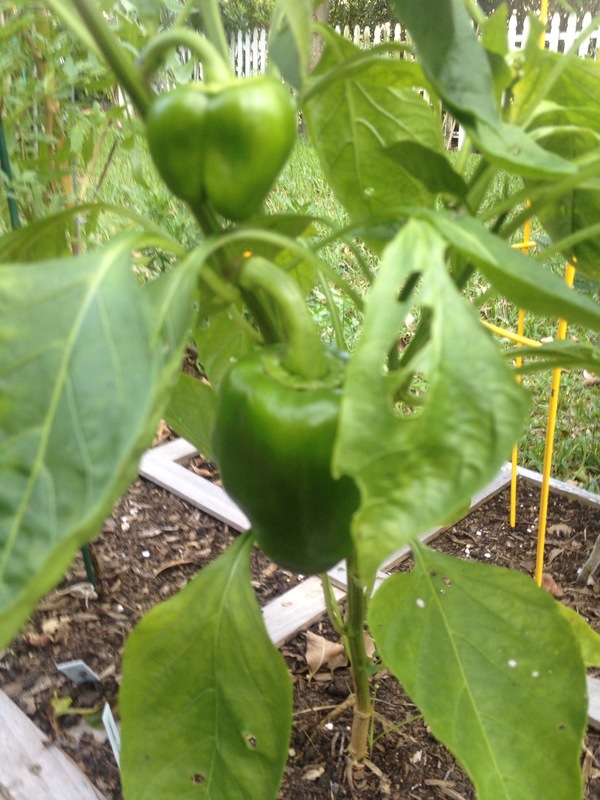 It is now blooming quite a bit, and although I couldn’t get a good picture showing one, it has some little tiny pepper pods beginning to grow. Like the plant, the pods should be streaked with white. 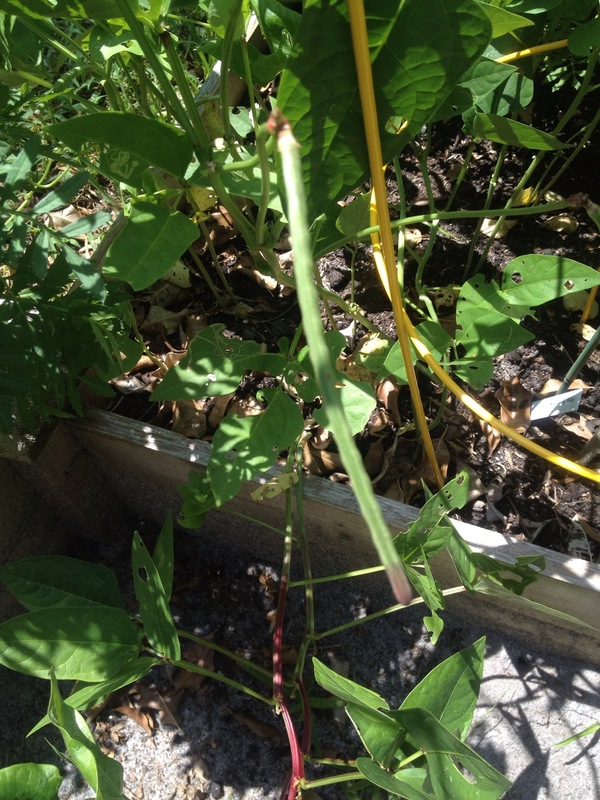 I also noticed during this tour that the first of my cowpeas are developing pods. 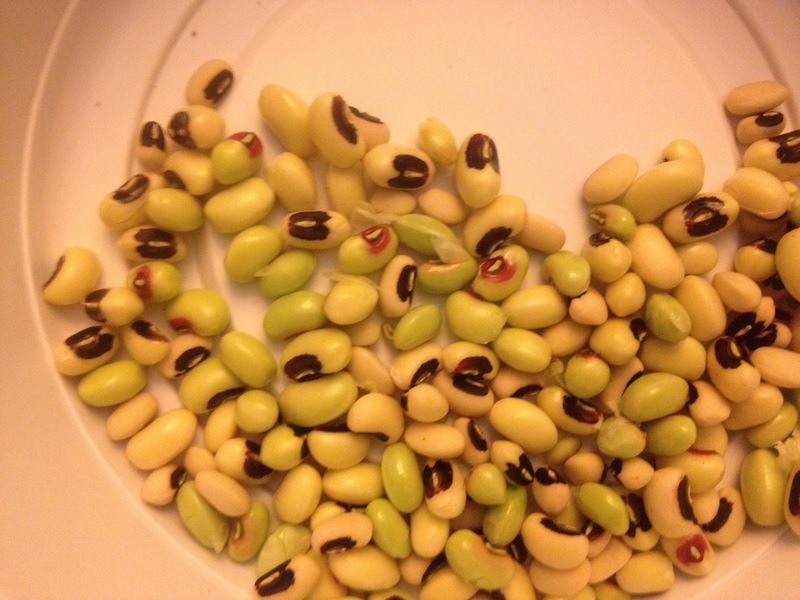 The picture below shows some California 46 Blackeyed peas on their way to becoming harvest-ready. 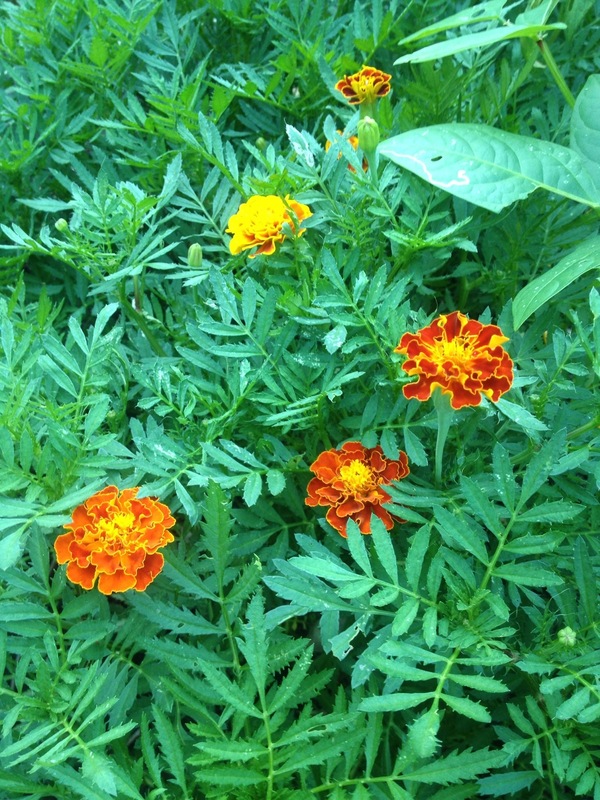 As you can see in this next picture, the marigolds are really beginning to come into bloom now. And the rose bush I just planted the other day made it through the storm okay, even though it needed to be staked to stabilize it. In my butterfly garden, several of the nectar sources are really popping out in blossoms. 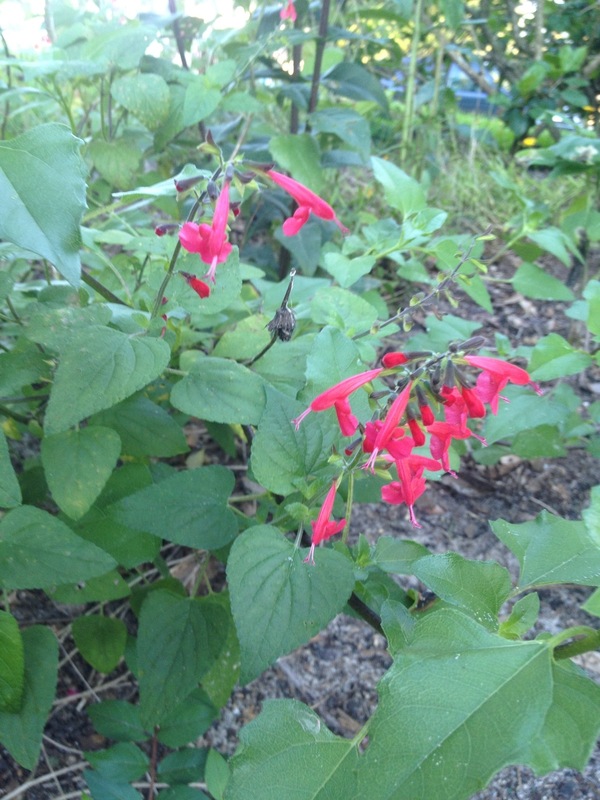 This picture shows some Scarlet Sage (Salvia coccinea). 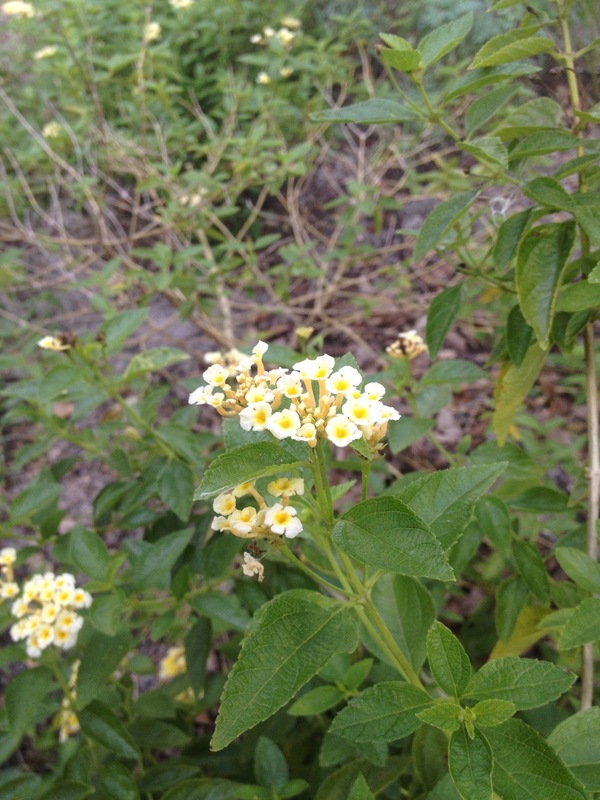 Next is one of only three species of lantana native to Florida, Lantana depressa, so named because it stays low to the ground, rarely exceeding a foot in height. Towering above the other plants in the area is this rosinweed (Silphium integrifolium). This is the same blossom that I showed being weighed down by the rain in my Wordless Wednesday Walkaround blog post earlier this week. As an aside in case you are wondering, I do have other tall varieties planted nearby; they just haven’t grown yet. I am hoping they will catch up by late summer. Since the storm left, I have noticed an incredible number of butterflies hanging around, but I have yet to get a picture worth posting. So far, I have seen several Zebra Longwings (Florida’s state butterfly), a couple Giant Swallowtails, a Black Swallowtail, and numerous Gulf Fritillaries. 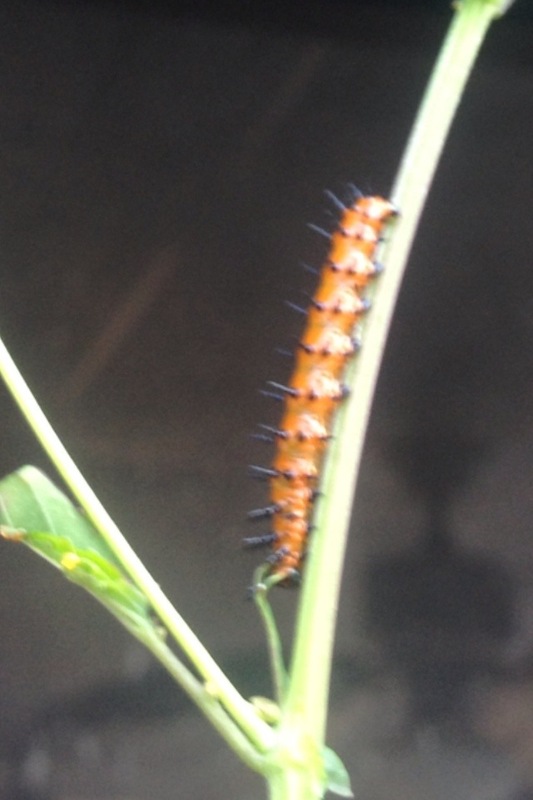 Speaking of Gulf Fritillaries, I found several Gulf Fritillary caterpillars on my passion vine, including the one in the next picture. I also have a couple hills of young, still rather tender pigeon pea bushes. The sandy soil nearby must have taken quite a pounding with the rain, as the plants now look like those below. Although they are still standing upright, I am concerned about the sand filtering too much light, inhibiting photosynthesis. For that reason, I will try to gently wash the sand off the leaves tomorrow. However, anyone who has tried to wash sand off themselves or anything else following a visit to the beach will recall that sand doesn’t loosen its grip easily, especially with just a gentle washing. I will leave you with that for now. 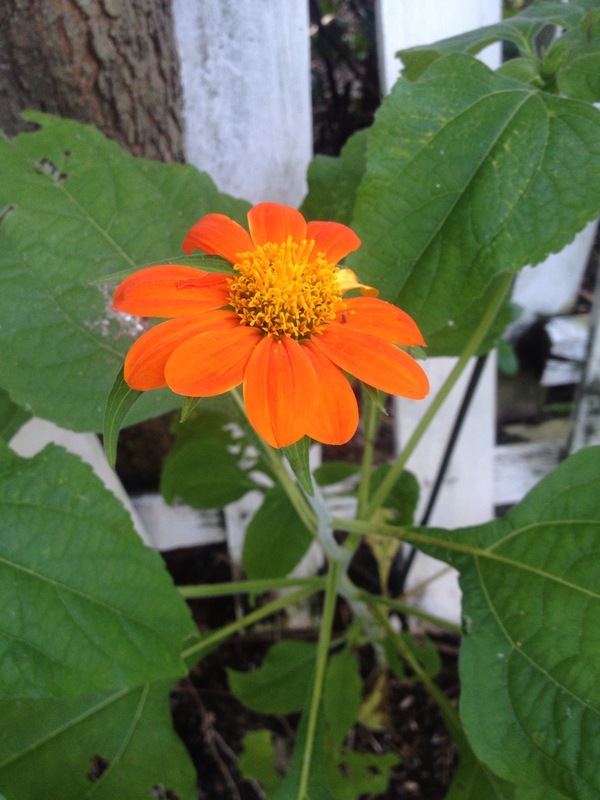 I hope you have enjoyed this brief tour around my garden!